The form of the Sukkah Soul sukkah kit by Susan Shender is inspired by three imaginative ideas that are interwoven during Sukkot: the Kabbalah’s Sefirot, the ushpizin or guests we welcome at Sukkot and specific Psalms read during the holiday. Through the language of the Sefirot, G*d is expressed in ten manifestations or emanations, as it were, like kindness, strength and beauty. All of these manifestations have avenues of connection to one another. These energies are imagined in triangles forming triads of relationships. Seven of manifestations coordinate with ushpizin and Psalms. 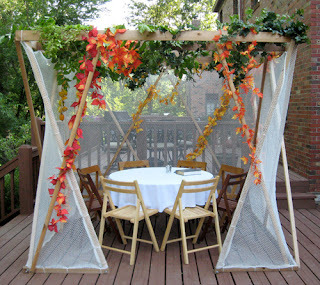 Sitting in the Sukkah Soul sukkah, one may imagine that its triangular forms symbolize the Sefirot / the ushpizin-guests / the Psalms and feel surrounded by the Sefirotic triads during dining and study.